SIGNED AND PERSONALIZED PAPERBACK AVAILABLE AT www.pauldailbooks.com. Three years after his brother Peter’s suicide, David Blithe is still haunted by this cryptic message found scrawled on a piece of newspaper in his brother’s apartment. David can only believe that Peter must have gone insane… until the supernatural being that pushed his brother to his death finds David in Colorado. The encounter nearly kills him. Badly scarred, in a fight for his soul and his sanity, he escapes into the mountains. Three months later, David collapses in the Montana cabin of Dr. Robert Marrick, his wife, and their teenage daughter, Jeannie. Something more than just coincidence seems to have driven David to the Marrick cabin, something that seems to revolve around the girl, but in the ensuing chaos, will he be able to save Jeannie’s life without losing his own? 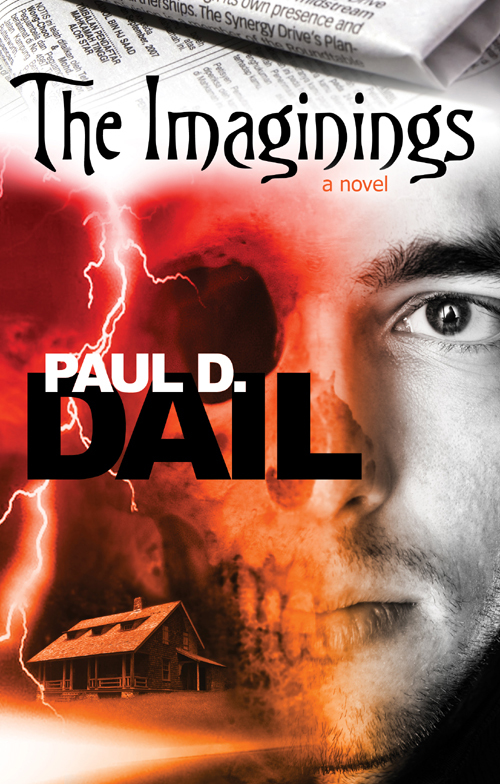 The Imaginings takes the reader into a world where the questions of “right” and “wrong” aren’t so easily defined, locking David and Jeannie in battle with an evil that threatens not only their lives but ultimately all of humanity. This e book was a wonderful read. Thank you for writing it! I enjoyed it so much! As a random aside,is the funky artwork of bones above, like the Cemetery of the Capuchins in Rome ? The Imaginings is a great book. It is exciting to get such enjoyment from your published work! Paul, I did it. I bought your book from Smashwords so my kids can’t access it on my kindle account with their ipods. Sneaky, huh? I don’t need their nightmares along with mine. 🙂 Now I’m going to screw up my courage, step out of my element, and give it a read! Can’t promise a review on my kid lit blog though, lol. Thanks, Michelle. So you’re my one Smashwords sale, eh? ha ha. After meeting you on the Halloween Hop, I decided to buy The Imaginings. I started last night, right before bed and had to stop because the television+no electricity motif was creeping me out so effectively, I knew I’d never sleep if I kept reading! I am absolutely enjoying it! Thanks for writing and publishing The Imaginings! Thanks so much, Aniko. And very flattering, kind words. I’ll look forward to hearing your continued thoughts. And again, it was a pleasure to meet you as part of the Hop, and I look forward to getting to know you better.